One of the qualities of a really good animated film (or a children's story) is the ability to capture the hearts of both kids and adults. 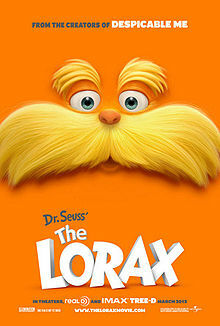 I think The Lorax just did that. That's why I loved it. The eco-friendly story of the film revolved around how important it is to take care of the environment while being presented in a brilliant and colorful 3D animation. However, what struck me most was the underlying message on top of the already good story it had. It's about initiating change and how one person can make a great difference in the world. To quote one line from the movie, "(referring to the seed of a tree) It's not about what it is. It's about what it can become." What a beautiful piece of wisdom. There's a lot more to learn from the movie by the way. Anyway, the mere fact that this family movie left a bit of inspiration on me is enough for me to give it a good rating of 9. I think it's worth watching.